Samsung has revealed its latest DualView compact camera. The series, which kicked-off in 2009 by the release of the TL225 and TL220 models, equips front and rear LCD displays so photographers can get themselves in the image without the miss framing that results from holding the camera at arm's length. The new DV300F is the former in the DualView line to include Wi-Fi connectivity to let users to cut out the middleman and email shots or upload them to their social media site of choice directly from the camera. The DV300F features 16-megapixel resolution, 5x optical zoom and 25 mm wide-angle lens and, in addition to the 3-inch rear touch screen display, the DV300F's 1.5-inch front-facing LCD display not only shows the present image framing, but also features a Child Mode that displays an animation to keep little ones' eyes focused on the camera. Moreover it has the ability to instantly upload images and video to sites such as Facebook, Picasa, Flickr and YouTube, the wireless connectivity also allows images stored on the camera's microSD card to be backed up to a PC or cloud services, such as Samsung's own AllShare Play and Microsoft's SkyDrive, without means of wires. 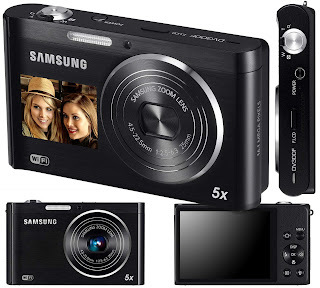 This camera also comes with 12 background templates and onboard image manipulation functions, such as Picture-in-Picture that lets one image to be inserted within another image or video, and a Split Shot feature that allows up to three different images - even ones imported from other cameras - to be merged into one image. There is also a new Motion Photo feature that allows time to be frozen around a moving subject.